Both my husband and I love to cook, and we delight in sharing our gastronomic adventures with those we love. However, I’ve always hated using plastic wrap each time we take one of our culinary creations out the door. So I set out to find a plastic wrap alternative. When I mentioned it to a like-minded friend, she suggested I get a set of silicone stretch lids. It seemed like a great idea, but I struggled to get them on my favorite handmade bowls. Then I found beeswax wraps. These are a kitchen game changer! 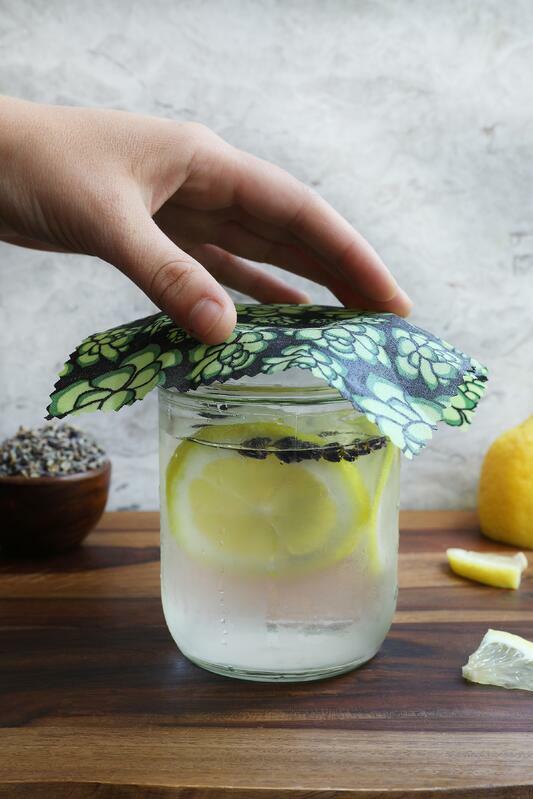 Not only do they cover a bowl or platter on our way out the door, but they’re also great for wrapping up anything you’d use plastic wrap for (like a half piece of fruit), or as a lid for a nourishing herbal infusion. I knew I could make them myself, so I set off on a Pinterest adventure. Little did I know just how much adventure awaited me! What I thought would be a quick dip into my stash of beeswax for salve making turned into a three-week spree of mad scientist experimentation. That’s right, three weeks of trial and error! Why? Because there were so many different ways to make homemade wraps. And when I failed at my first attempt, I was determined to find the best way to make a beeswax wrap that would measure up to my expectations. When testing this recipe, I made large squares (14 inches), medium squares (10 inches), and a circle for my favorite big bowl. I also sewed up a few snack bags; if you go this route, I recommend sewing them before waxing. If you happen to have pinking shears, I'd recommend putting them to use, as they will reduce fraying as you cut and wax your fabric. One very common method I found on Pinterest was to simply coat fabric with beeswax and, it being the easiest, that’s how I started. I began by cutting a test square of fabric, lightly sprinkling beeswax pastilles on the cloth, and popping everything into my oven. A few minutes later the wax had melted, allowing me to brush it around to evenly coat the fabric. It quickly set up, but the result was a very stiff wrap with none of the stickiness that makes conventional plastic wraps so useful. Plus, when I tried to mold it around a bowl, it cracked. Strike one. These are two of the three ingredients in the wraps I had purchased, and this simple combination also seemed super easy to whip up. I prepped another test square, put the beeswax and jojoba oil in a small double boiler, melted the mixture, brushed it on, popped everything into the oven, pulled it out, and brushed again for an even coating. Attempt two was a step in the right direction. These wraps were pliable and would form around a bowl, but they still wouldn’t stick to themselves or the sides of the bowl. Strike two. After my prior try with jojoba oil, I was skeptical that this attempt would prove much more successful. I was pleasantly surprised that it worked! 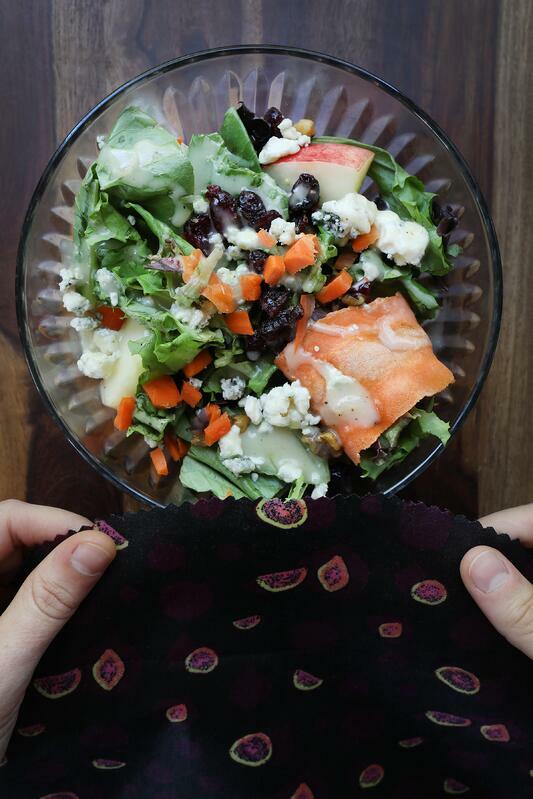 The wraps were pliable, sticky, and easy to create. However, I found that they left a coconut oil film on everything they touched, and it took a surprising amount of elbow grease to get this residue off of a mason jar lid’s grooves. Not a strike, per se — it worked, but it was messy. Maybe a lucky bunt? The commercial beeswax wraps that I had purchased contained pine resin. Since the term copal describes resinous substances in an intermediate stage of polymerization between softer and amber resins, I thought our wildharvested copal just might work. And it did! Plus, it saved me from needing to source pine resin. This blend seemed to meet all of my criteria, and I was so happy with my results that I published the recipe here in the original version of this blog post. I did receive some feedback from friends that they didn’t enjoy having to wait so long for the copal to melt, and some people who didn’t source their copal resin from us had a difficult time getting it to melt at all. Since one of my goals was also to create a user-friendly recipe with consistent results, I went back to the drawing board. As much as I had initially resisted using pine resin, I thought that maybe there was a reason that many of the wraps on the market today include this ingredient. As it turns out, this is indeed the case! The pine resin melted in a fraction of the time the copal required, and all of my recipe testers found that it worked more consistently. 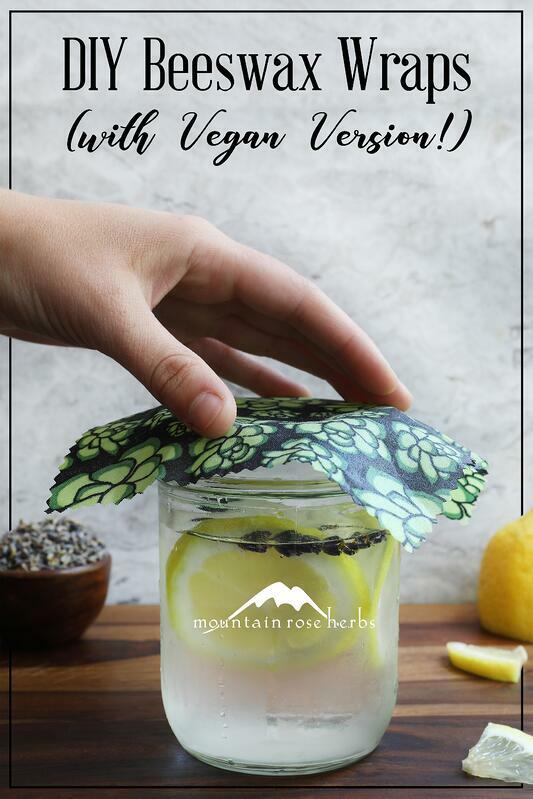 We do not currently offer pine resin here at Mountain Rose Herbs, so we urge you to seek out and opt for a pine resin that is sustainably sourced and harvested to help protect these amazing trees and their ecosystems. 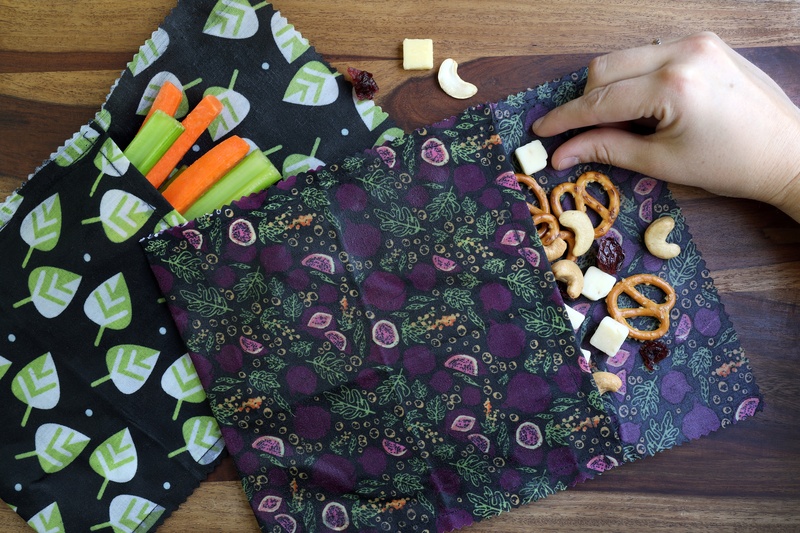 It is will great pleasure (and relief) that I present to you, the very best DIY reusable wraps! 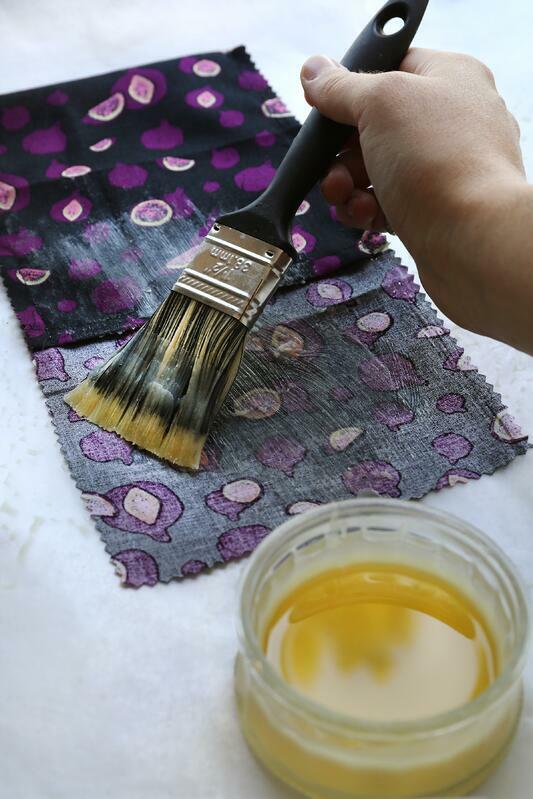 The resulting treated fabric has the same feeling as my purchased beeswax wraps and is totally customizable into any shape, pattern, or color you want! Makes (2 to 3) 12 x 12 inch cloths. Cut fabric into desired shapes and sizes. Place pine resin in a double boiler or glass measuring cup and set in a saucepan. Add water to saucepan until the mixture inside the double boiler or measuring cup is below waterline. Turn burn to medium-high heat. Allow ingredients to melt and meld together, about 20 to 25 minutes. Cover large cookie sheet with a sheet of parchment paper larger than your biggest piece of fabric. Spread a fabric piece (or pieces, depending on size) flat on parchment paper. Brush mixture lightly onto fabric. It might solidify, which is fine, as you'll be able to redistribute later. It’s easy to oversaturate, so remember that it’s easier to add more than take the excess away. Put cookie sheet in oven for 2 minutes, or until fabric looks wet. Remove from oven and look for any dry spots. Brush mixture over these uncovered areas, applying more coating as needed. If you notice unevenness after adding more, you can place it back in the oven for a few minutes to smooth. Place the next wrap(s) you are going to make on top of the finished fabric to soak up any excess coating mixture. Work quickly, as you don’t want the wax to begin to solidify. Once you’ve pressed any excess onto the new cloth, peel apart and hang your completed wrap(s) to dry. Drying only takes a few minutes. Repeat steps with additional pieces of fabric until you are out of coating mixture. Once I found the perfect recipe using beeswax, I figured that making a vegan version with carnauba wax wouldn’t be that difficult. Using the notes in our vegan calendula salve recipe, I cut down the amount of wax from my original recipe and added more oil to account for the more brittle nature of the carnauba. It took a bit more trial and error, but I got there! These DIY bee-free wraps have a slightly oilier feel and leave just a touch more residue than my store-bought beeswax wraps, but they stick wonderfully to themselves and my favorite bowls too. Place pine resin, carnauba wax, and jojoba oil in a double boiler or glass measuring cup and set in a saucepan. I tried various fabrics and I found that thinner material made of 100% cotton was best for clinging and absorbed less of the mixture for easier coating. Be sure to find a good hanging place for drying wraps before you start. If possible, I recommend hanging a string and then using clothes pins to dry them. No matter the type of reusable food wrap you choose to make, their care directions are the same. Wash in cool water with a mild soap, like Castille soap, and air dry. Store folded up in a drawer away from sunlight and heat sources. You can alter the amount of resin to make them more or less sticky. I found the above ratios to be the best for my household. Any more resin, and I find the wraps leave a residue on my bowls, and any less, I found that they didn’t stick as much as desired. Depending on how often you use them, you’ll need to refresh the wraps every 6 to 12 months. To refresh, simply pop them back in the oven, remove, and brush a light coat of the melted resin, wax, and oil mixture evenly over the cloth. It's possible to over-saturate the cloths, so start with a light coat and apply more as needed to get a more even saturation. If you get too much, you can apply another cloth on top to absorb the excess. Beeswax wraps aren’t as air tight as plastic wrap. You can reinforce your wrap’s “cling” by using with a rubber band. Want more kitchen care INSPIRATION? Check Out Our Natural Cleaning Solution Recipes! Kiley Gwynn, certified BJCP beer judge, enjoys a wide variety of hobbies but her deepest passion is homebrewing. She loves spreading the joy of homebrewing and over the last decade has become deeply involved in the Oregon homebrewing community. 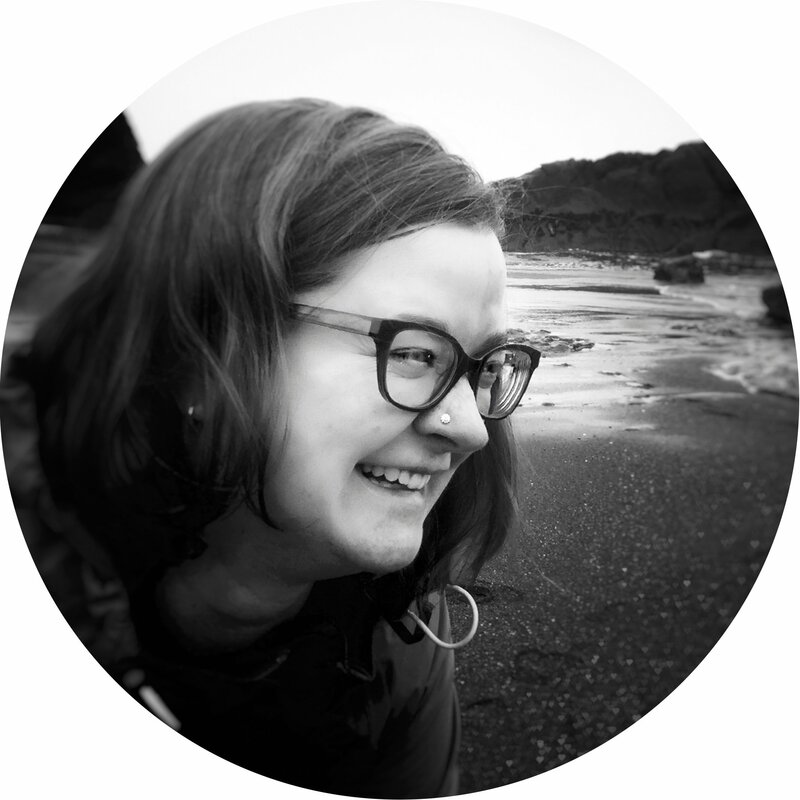 Kiley is an award-winning homebrewer who holds a seat on the executive committee of Cascade Brewers Society and is a member of American Homebrewers Association Diversity Subcommittee. She loves brewing herbally inspired beers at educational events like Learn to Homebrew Day. When she’s not working as a blog contributor at Mountain Rose Herbs or in her homebrewery, you’ll likely find her under a pile of yarn with a crochet project, in the kitchen working on her latest small batch canning adventure or chasing her rescued red heeler down the beach. Best viewed while sipping tea!